Stick a (pitch)fork in it. There’s a rule in Hollywood: No matter how bad your movie is, if it makes a boatload of money, there’s gonna be a sequel. The pretty darn awful 2010 film Clash of the Titans took in just shy of half a billion dollars at the box office. So, on to the inevitable, but I doubt the sequel will be its equal. That’s not saying much, since the original (itself a remake of a bad 1981 film) was all flash and no substance, telling of how the Greeks are losing interest in their gods, and, in return, the gods are losing patience with the Greeks. There were heroes, like Perseus, and villains, like Hades, and monsters, like the Kraken, and it was all a big, loud slog to watch. I’m not sure if it’s enough to say that this sequel is better than its predecessor, but for the first 15 minutes, it’s pretty good. The demigod Perseus (Sam Worthington) has retired from the fighting life to be a fisherman and a good single dad to 10-year-old Helius. But his dad, the full-fledged-god Zeus (Liam Neeson) has noted that the Greeks are now even less interested in any kind of worship, which means the gods might lose their immortality. Zeus’ wicked brother Hades (Ralph Fiennes) — the god of the underworld — won’t just sit back and let this happen. Nope, he wants to unleash their dad, Kronos, upon the heathens so that the Earth shall be cleansed, or some such malarkey. One brother kidnaps another. One son goes to the rescue. Other relatives of others gods show up and exude either malevolence or goofy comedy relief. But all of that is after those first 15 minutes, and by then, the film has started to devolve into an excess of confused storytelling, overblown visual effects and poorly rendered 3D that’s about as effective to regular viewers as it would be to members of the film’s happy Cyclops family. Yes, that’s happy Cyclops family — creatures that fit not so neatly in a film that also features flying, fire-breathing, two-headed creatures and big, angry, two-torsoed swordfighters and, of course, the huge, black-and-red Kronos, who is made out of molten lava, makes a lot of noise, tosses a few fireballs, and must surely want to be known as the new Kraken, but only comes across as a ripoff of the mountaintop devil in Disney’s Fantasia. There are a whole lot of characters to keep track of here, and it’s hard to remember if they’re good or bad or just conflicted. It’s harder still to care. Near the end, one of them does a 180-degree turnabout in attitude, jumping from being a bad guy to a good guy, without benefit of any explanation to anyone who’s still trying to make sense of what’s going on. In a few cases, specifically those involving Fiennes and Neeson and especially Bill Nighy as the weaponmaker Hephaestus, there’s some good acting. 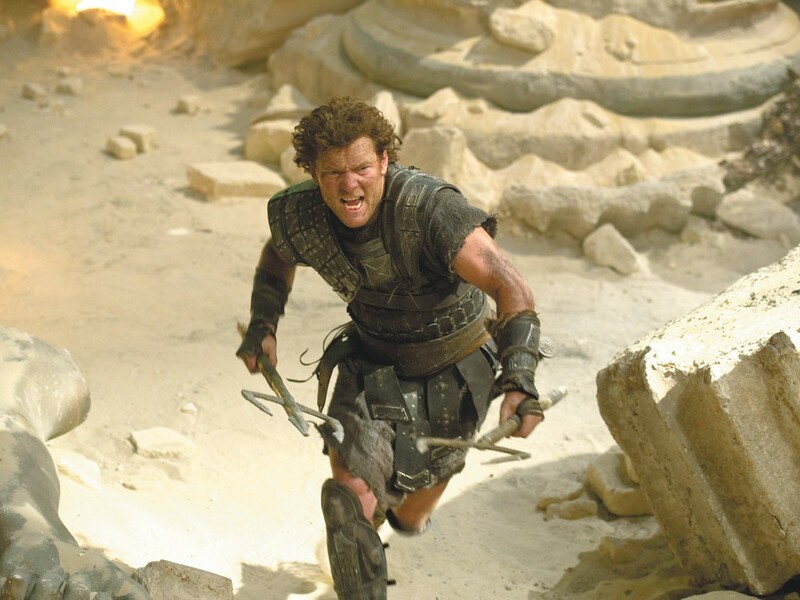 But, as in Clash of the Titans, Worthington’s Perseus comes across as a flat, cardboard figure who’s going about his heroic business as if it were a chore rather than a challenge. And it’s hard to figure out why the warrior Andromeda is even in the film, beyond the fact that Rosamund Pike, who plays her, looks good in tight brown leather. There’s at least a hint of a theme: Only family matters. That idea shows up often in Greek mythology. But the central story that’s told here isn’t based on any myth. It’s a modern contrivance — what might have happened if Perseus didn’t settle down into a peaceful civilian life — and it’s all a bunch of hooey.